E R Truitt is a medieval historian at Bryn Mawr College in Pennsylvania. Her book, Medieval Robots: Mechanism, Magic, Nature, and Art, is out in June. In 807 the Abbasid caliph in Baghdad, Harun al-Rashid, sent Charlemagne a gift the like of which had never been seen in the Christian empire: a brass water clock. It chimed the hours by dropping small metal balls into a bowl. Instead of a numbered dial, the clock displayed the time with 12 mechanical horsemen that popped out of small windows, rather like an Advent calendar. It was a thing of beauty and ingenuity, and the Frankish chronicler who recorded the gift marvelled how it had been ‘wondrously wrought by mechanical art’. But given the earliness of the date, what’s not clear is quite what he might have meant by that. Certain technologies are so characteristic of their historical milieux that they serve as a kind of shorthand. The arresting title credit sequence to the TV series Game of Thrones (2011-) proclaims the show’s medieval setting with an assortment of clockpunk gears, waterwheels, winches and pulleys. In fact, despite the existence of working models such as Harun al-Rashid’s gift, it was another 500 years before similar contraptions started to emerge in Europe. That was at the turn of the 14th century, towards the end of the medieval period – the very era, in fact, whose political machinations reportedly inspired the plot of Game of Thrones. When mechanical clockwork finally took off, it spread fast. In the first decades of the 14th century, it became so ubiquitous that, in 1324, the treasurer of Lincoln Cathedral offered a substantial donation to build a new clock, to address the embarrassing problem that ‘the cathedral was destitute of what other cathedrals, churches, and convents almost everywhere in the world are generally known to possess’. It’s tempting, then, to see the rise of the mechanical clock as a kind of overnight success. But technological ages rarely have neat boundaries. Throughout the Latin Middle Ages we find references to many apparent anachronisms, many confounding examples of mechanical art. Musical fountains. Robotic servants. Mechanical beasts and artificial songbirds. Most were designed and built beyond the boundaries of Latin Christendom, in the cosmopolitan courts of Baghdad, Damascus, Constantinople and Karakorum. Such automata came to medieval Europe as gifts from foreign rulers, or were reported in texts by travellers to these faraway places. In the mid-10th century, for instance, the Italian diplomat Liudprand of Cremona described the ceremonial throne room in the Byzantine emperor’s palace in Constantinople. In a building adjacent to the Great Palace complex, Emperor Constantine VII received foreign guests while seated on a throne flanked by golden lions that ‘gave a dreadful roar with open mouth and quivering tongue’ and switched their tails back and forth. Next to the throne stood a life-sized golden tree, on whose branches perched dozens of gilt birds, each singing the song of its particular species. When Liudprand performed the customary prostration before the emperor, the throne rose up to the ceiling, potentate still perched on top. At length, the emperor returned to earth in a different robe, having effected a costume change during his journey into the rafters. Other Latin Christians, confronted with similarly exotic wonders, were more forthcoming with theories. Engineers in the West might have lacked the knowledge to copy these complex machines or invent new ones, but thanks to gifts such as Harun al-Rashid’s clock and travel accounts such as Liudprand’s, different kinds of automata became known throughout the Christian world. In time, scholars and philosophers used their own scientific ideas to account for them. Their framework did not rely on a thorough understanding of mechanics. How could it? The kind of mechanical knowledge that had flourished since antiquity in the East had been lost to Europe following the decline of the western Roman Empire. Instead, they talked about what they knew: the hidden powers of Nature, the fundamental sympathies between celestial bodies and earthly things, and the certainty that demons existed and intervened in human affairs. Arthur C Clarke’s dictum that any sufficiently advanced technology is indistinguishable from magic was rarely more apposite. Yet the very blurriness of that boundary made it fertile territory for the medieval Christian mind. In time, the mechanical age might have disenchanted the world – but its eventual victory was much slower than the clock craze might suggest. And in the meantime, there were centuries of magical machines. In the medieval Latin world, Nature could – and often did – act predictably. But some phenomena were sufficiently weird and rare that they could not be considered of a piece with the rest of the natural world. They therefore were classified as preternatural: literally, praeter naturalis or ‘beyond nature’. What might fall into this category? Pretty much any freak occurrence or deviation from the ordinary course of things: a two-headed sheep, for example. Then again, some phenomena qualified as preternatural because their causes were not readily apparent and were thus difficult to know. Take certain hidden – but essential – characteristics of objects, such as the supposedly fire-retardant skin of the salamander, or the way that certain gems were thought to detect or counteract poison. Magnets were, of course, a clear case of the preternatural at work. If the manifestations of the preternatural were various, so were its causes. Nature herself might be responsible – just because she often behaved predictably did not mean that she was required to do so – but so, equally, might demons and angels. People of great ability and learning could use their knowledge, acquired from ancient texts, to predict preternatural events such as eclipses. Or they might harness the secret properties of plants or natural laws to bring about certain desired outcomes. Magic was largely a matter of manipulating this preternatural domain: summoning demons, interpreting the stars, and preparing a physic could all fall under the same capacious heading. All of which is to say, there were several possible explanations for the technological marvels that were arriving from the east and south. Robert of Clari, a French knight during the disastrous Fourth Crusade of 1204, described copper statues on the Hippodrome that moved ‘by enchantment’. Several decades later, Franciscan missionaries to the Mongol Empire reported on the lifelike artificial birds at the Khan’s palace and speculated that demons might be the cause (though they didn’t rule out superior engineering as an alternative theory). Does a talking statue owe its powers to celestial influence or demonic intervention? Because the category of the preternatural encompassed so many objects and phenomena, and because there were competing, rationalised explanations for preternatural things, it could be difficult to discern the correct cause. Does a talking statue owe its powers to celestial influence or demonic intervention? According to one legend, Albert the Great – a 13th-century German theologian, university professor, bishop, and saint – used his knowledge to make a prophetic robot. One of Albert’s brothers in the Dominican Order went to visit him in his cell, knocked on the door, and was told to enter. When the friar went inside he saw that it was not Brother Albert who had answered his knock, but a strange, life-like android. Thinking that the creature must be some kind of demon, the monk promptly destroyed it, only to be scolded for his rashness by a weary and frustrated Albert, who explained that he had been able to create his robot because of a very rare planetary conjunction that happened only once every 30,000 years. In legend, fiction and philosophy, writers offered explanations for the moving statues, artificial animals and musical figures that they knew were part of the world beyond Latin Christendom. Like us, they used technology to evoke particular places or cultures. The golden tree with artificial singing birds that confounded Liudprand on his visit to Constantinople appears to have been a fairly common type of automaton: it appears in the palaces of Samarra and Baghdad and, later, in the courts of central India. In the early 13th century, the sultan of Damascus sent a metal tree with mechanical songbirds as a gift to the Holy Roman Emperor Frederick II. But this same object also took root in the Western imagination: we find writers of fiction in medieval Europe including golden trees with eerily lifelike artificial birds in many descriptions of courts in Babylon and India. Of course, the Latin West did not retain its innocence of mechanical explanations forever. Three centuries after Gerbert taught his students how to understand the heavens with an armillary sphere, the enthusiasm for mechanical clocks began to sweep northern Europe. These giant timepieces could model the cosmos, chime the hour, predict eclipses and represent the totality of human history, from the fall of humankind in the Garden of Eden to the birth and death of Jesus, and his promised return. Astronomical instruments, like astrolabes and armillary spheres, oriented the viewer in the cosmos by showing the phases of the moon, the signs of the zodiac and the movements of the planets. Carillons, programmed with melodies, audibly marked the passage of time. Large moving figures of people, weighted with Christian symbolism, appear as monks, Jesus, the Virgin Mary. They offered a master narrative that fused past, present and future (including salvation). The monumental clocks of the late medieval period employed cutting-edge technology to represent secular and sacred chronology in one single timeline. Secular powers were no slower to embrace the new technologies. Like their counterparts in distant capitals, European rulers incorporated mechanical marvels into their courtly pageantry. The day before his official coronation in Westminster Abbey in 1377, Richard II of England was ‘crowned’ by a golden mechanical angel – made by the goldsmiths’ guild – during his coronation pageant in Cheapside. And yet, although medieval Europeans had figured out how to build the same kinds of complex automata that people in other places had been designing and constructing for centuries, they did not stop believing in preternatural causes. They merely added ‘mechanical’ to the list of possible explanations. Just as one person’s ecstatic visions might equally be attributed to divine inspiration or diabolical trickery, a talking or moving statue could be ascribed to artisanal or engineering know-how, the science of the stars, or demonic art. Certainly the London goldsmiths in 1377 were in no doubt about how the marvellous angel worked. But because a range of possible causes could animate automata, reactions to them in this late medieval period tended to depend heavily on the perspective of the individual. Death threw down a rope, they [fellow guests] tied it around Borra, and Death hanged him. You would not believe the racket that he made, weeping and expressing his terror, and he urinated into his underclothes, and urine fell on the heads of the people below. He was quite convinced he was being carried off to Hell. The king marvelled at this and was greatly amused. Such theatrical tricks sound a little gimcrack to us, but if the very stage machinery might partake of uncanny forces, no wonder Borra was afraid. Nevertheless, as mechanical technology spread throughout Europe, mechanical explanations of automata (and machines in general) gradually prevailed over magical alternatives. By the end of the 17th century, the realm of the preternatural had largely vanished. Technological marvels were understood to operate within the boundaries of natural laws rather than at the margins of them. Nature went from being a powerful, even capricious entity to an abstract noun denoted with a lower-case ‘n’: predictable, regular, and subject to unvarying law, like the movements of a mechanical clock. This new mechanistic world-view prevailed for centuries. But the preternatural lingered, in hidden and surprising ways. In the 19th century, scientists and artists offered a vision of the natural world that was alive with hidden powers and sympathies. Machines such as the galvanometer – to measure electricity – placed scientists in communication with invisible forces. Perhaps the very spark of life was electrical. Even today, we find traces of belief in the preternatural, though it is found more often in conjunction with natural, rather than artificial, phenomena: the idea that one can balance an egg on end more easily at the vernal equinox, for example, or a belief in ley lines and other Earth mysteries. Yet our ongoing fascination with machines that escape our control or bridge the human-machine divide, played out countless times in books and on screen, suggest that a touch of that old medieval wonder still adheres to the mechanical realm. IN SUITE 712 of the Eventi Hotel, high above the sticky June bustle of Midtown Manhattan, New York, one of the world’s most advanced consumer robots awaits command. “Wake up, Jibo,” says Cynthia Breazeal, his creator. The robot’s round head shakes awake. He lets out a tinkling noise, then a yawn. Jibo’s two-part body twists and stretches and his face, with a single digital eye, switches on and turns to look at us. He looks like a Pixar character come to life. Jibo is the first robot designed to be used by the whole family. He’s not a niche robot with a single purpose, like a Roomba, nor is he a toy. Available for $499 through an Indiegogo crowdfunding campaign that starts this week, Jibo is designed to tap into the social fabric of a household and help out. The first model, which will ship in 2015, will perform simple tasks like taking voice reminders, fielding phone calls and messages – connecting to the family’s phones through Wi-Fi. He will also act as the heart of the home connecting to iPads, TVs and games consoles. More complex skills include automatically identifying the faces in a room and taking pictures on request and reading a story to a child. “I’m great, thanks for asking,” he says, cocking his head slightly as his digital eye curves into a grin. Jibo explains all the different things he can do, after a quick dance to Simon and Garfunkel’s 59th Street Bridge Song. “I would say this is the first social, personal robot,” says Illah Nourbakhsh, a roboticist at Carnegie Mellon University in Pittsburgh. Jibo’s body language and expressions are designed to convey emotional states in the same way humans do, while his sensors and programming are tuned to our presence. Jibo knows when someone enters a room, and can identify who it is if he can see their face or hear their voice. The idea is that Jibo’s social skills help him to fit seamlessly into the household. Jibo’s body and head movements are complex and smooth enough to convey convincing human-like body language but he cannot move around. For that, he relies on the humans in the household to pick him up – he weighs a mere 2.7 kilos – and move him from place to place. Jibo charges up via wireless pads plugged in around the house, or he can run on batteries for about 30 minutes away from a power source. When he joins the family at the dinner table, for instance. Jibo turns to face whoever is talking, so an absent family member can use him to video chat as the rest of the family sit around the table. “With Jibo, you feel like you’re really part of the group dynamic,” says Breazeal. “I think that’s enormous, I love it,” says Ken Goldberg, a roboticist from the University of California in Berkeley. Goldberg works on robots that can move around their environment and manipulate it, more in line with the traditional notion of the home robot. But such tasks are difficult to perfect: the dream of the robot butler is a long way off. “Right now, the most state-of-the-art robot still takes a good 20 minutes to fold a small towel,” Goldberg says. Breazeal’s research at the MIT Media Lab, along with that of Bilge Mutlu at the University of Wisconsin-Madison, has shown how important it is for robot-human communication that robots can express emotion. “The ability to turn your head around and pay attention to something else has been taken for granted, but it’s huge,” says Mutlu. Breazeal is also opening Jibo up to developers as a platform on which to build new kinds of apps, such as ones that let the robot place takeaway orders for “the usual” on request, or that control the lighting and heating in a home, or even keep an eye on activity patterns to make sure that senior household members are moving enough. But socially aware robots raise new ethical questions. Would it be appropriate, for instance, for Jibo to announce that the senior family member he has been watching has fallen down and cannot get up? “We’re going to have a really interesting dilemma about when a robot can violate privacy to save a life,” Nourbakhsh says. Cientistas britânicos lançaram nesta semana um pequeno robô, capaz de operar fetos ainda no útero das mães. A máquina, que custou cerca de R$ 30 milhões, pode revolucionar o tratamento de más formações congênitas. O minúsculo aparelho é capaz de fornecer imagens em 3D dos bebês imersos na placenta. Com a visão do “paciente”, o robô começa as intervenções médicas, controladas por uma equipe de especialistas que ficam nos bastidores. A invenção poderia, por exemplo, fazer cirurgias ou até implantar células-tronco em órgãos com deformações da criança. O projeto é coordenado por engenheiros da University College London (UCL) e Universidade Católica da Lovaina, na Bélgica. De acordo com o líder da pesquisa, Sebastien Ourselin, o máquina evitará riscos tanto às mães quanto aos bebês. – O objetivo é criar tecnologias cirúrgicas menos invasivas para tratar uma ampla gama de doenças no útero, com muito menos risco para ambos – disse Ourselin ao The Guardian. O primeiro alvo em vista dos médicos é o tratamento de casos mais graves de espinha bífida, má formação da espinha dorsal que pode atinge um entre cada mil fetos. Ela ocorre quando a coluna não é plenamente desenvolvida, dando margem para que líquido amniótico penetre e leve consigo germes que poderiam atingir o cérebro e prejudicar o crescimento da criança. A intenção é que o novo robô possa fechar esses espaços na espinha, prevenindo a doença. No entanto, cientistas alertam que operações deste tipo têm elevado risco cirúrgico, com fortes chances de sequelas nas mães. Intervenções médicas em fetos só podem ser realizadas após, pelo menos, 26 semanas de gestação. O procedimento é praticamente impossível atualmente. O robô é composto por uma sonda muito fina e altamente flexível. A cabeça do equipamento teria um fio equipado com uma pequena câmera que iria usar pulsos de laser e ultra-som detecção – uma combinação conhecida como imagens foto-acústica – para gerar uma fotografia 3D no interior do útero. Estas imagens, então, seriam utilizadas pelos cirurgiões para orientar a sonda para a sua meta: a lacuna na coluna do feto. Unless an asteroid or deadly pandemic wipes us out first, the force we are most afraid will rob us of our place as rulers of Earth is robots. The warnings range from sarcastic to nervous to dead serious, but they all describe the same scenario: Robots become sentient, join forces and turn on us en masse. But with all the paranoia about machines, we’ve ignored another possibility: Animals learn to control robots and decide it’s their turn to rule the planet. This would be even more dangerous than dolphins evolving opposable thumbs. And the first signs of this coming threat are already starting to appear in laboratories around the world where robots are being driven by birds, trained by moths and controlled by the minds of monkeys. One of the most recent examples of animal-driven robots is this two-wheeled car steered by a male silkmoth. Researchers at the University of Tokyo in Japan placed the moth on a giant white ball that allowed it to control the vehicle much like a hand on a computer mouse. The insect was in hot pursuit of a female silkmoth’s pheromone, which had been laid down by the scientists and, unfortunately for the male, not a lady moth looking for love. The researchers hoped to characterize the moth’s tracking behavior and perhaps create autonomous robots that can follow chemical smells. The male moth just hoped to impress a classy gal with his sweet cruiser. Pepper the Parrot has the good fortune of having an engineer for an owner. Most birds can expect their squawks of boredom to be met by annoyed owners, squirts from a water gun, or exile into a far corner of the house. But not Pepper. This spoiled parrot received his own set of wheels, complete with infrared sensors to help him avoid hitting walls. Now when Pepper feels lonely, instead of just crying about it he hops on his buggy and drives through the house to where the people are. In a lab at Duke University, a neuroscientist is training monkeys to control robots with their minds. The monkeys can control computer cursors, virtual arms, real robotic arms, entire robotic exoskeletons and even whole robots on the other side of the globe. All just by thinking about it. Much of the research is geared toward helping paralyzed people regain mobility and control. But it’s not hard to imagine how it could lead to a monkey in South America commanding a robot army in California to steal bananas from all the farmers’ markets. Though probably not the best video to watch over lunch, the cockroach controlling a robot seen here is pretty fascinating. Created by artist Garnet Hertz of UC Irvine, the machine translates the movements of a 5-cm Giant Madagascar Hissing cockroach as it scurries over a large ball. You can almost imagine the little cockroach going “Weeee,” as it runs around strapped into its harness, doing its best to avoid crashing into walls. According the Hertz, the project is “striving to create a pseudo-intelligent system with the cockroach as the CPU.” The effect is a rather unpredictable creation, with the insect sometimes sitting still for five minutes or suddenly running in circles. At the University of Tokyo in Japan, scientists are creating strange hybrids between beast and machine. Seen here is one such animal, known as RatCar. 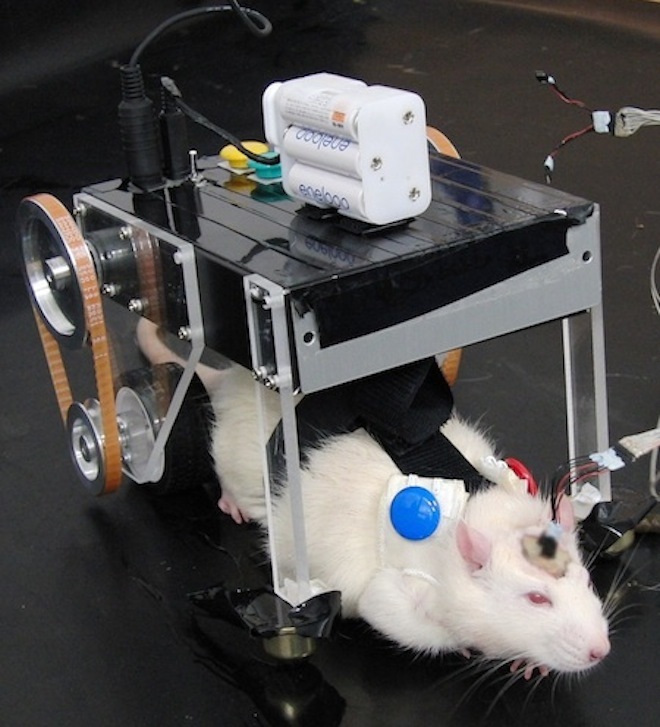 Intended to be a first step toward helping people with disabilities, RatCar has a brain-machine interface that lets the small rodent move a robot forward with the parts of its brain that ordinarily control its limbs. The result is a somewhat crazy looking cyborg. One day, the research could help paralyzed patients control wheelchairs directly with their brains. Swiss scientists have created what they call the Cyborg Fly. In this scheme, a fly is glued to a tether and placed in front of a mini movie screen. The screen plays a movie, and the fly thinks it is actually flying around obstacles. Meanwhile, a vision system tracks the wing motion of the fly and translates it into electronic commands which are sent to a little robot in an actual obstacle course. This may all seem innocent enough, but the key here is that the fly believes it is flying around, interacting with the environment. Could they fool other animals too? How about humans? What if we are all actually just tethered into a virtual reality, while our robot representatives are the ones actually experiencing the real world? Oh how the tables have turned: All this time animals have been driving robots, but here is a case of a robot driving the animals instead. Specifically, a small Roomba-esque machine is driving a flock of ducks. Known as the Robot Sheepdog, this project was part of the PhD thesis for engineer Richard Vaughan from the University of Oxford back in 1998. You might be wondering why a robot sheepdog is maneuvering some ducks. It’s simply because the researchers felt that sheep might be too big a hurdle to properly simulate at the time. As biological sheepdogs are first trained with ducks, these fowl seemed the perfect first step. The robot was able to watch the ducks with a camera and, using a mathematical model of their behavior, herd them with relative ease.